Welcome to this information about motoring art and the motoring artist's work. I launched this site in January 2008 and the intervening time has led to many interesting contacts with artists, artist's relatives and enthusiasts. This site is currently under major review with changes to the layout, information and images. I am currently working alphabetically through the Artists Listing so there may be some images lacking or duplication. Thanks to everyone who has been able to assist with further information to expand the listings, and special thanks to the auction houses who have allowed me to use images from their sales. When I set up the site I said that I had more information and images to add but if I waited for completeness nothing would be published. I have been able to work through some of the backlog but there still awaits more work to be done. As I make revisions a summary will appear on the 'News' page. A significant painting by Guy Lipscombe that has surfaced in 2013. Georges Boillot driving the Grand Prix Peugeot, winning the 1912 Mont Ventoux Hill Climb. 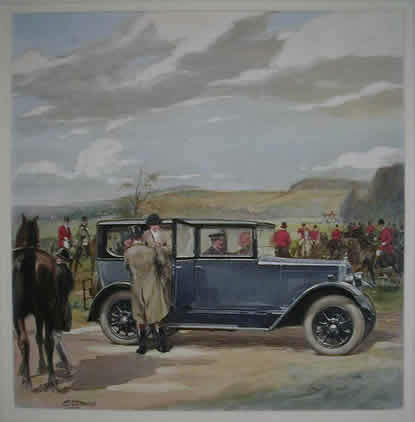 This painting was commissioned by Rudge-Whitworth to advertise the strength of their wire wheels and was used for their 1913 calendar, issued as prints and postcards. The 'Artists Listing' is a database of motoring artists and their work that I have been building up over the last twenty five years. The database was started because when I bought motoring artwork, often I could not find any biographical details of the artist in the standard references. I have limited it to artists who either have lived or worked in the UK. Again it is further limited to those who produced images of motorised transport. It does not include for example those artists that painted landscapes for Shell posters who could be described as motoring associated artists. It does reflect my knowledge about car artists rather than commercial vehicles or motor cycling but such artists where known are listed. In any case artists did not just specialise in one form of transport but at different times moved on when commissions were available. My main interest is art on paper/board, rather than the wider field of mascots, sculptures and ceramics. However, the main question is What is a motoring artist? This is the more difficult to answer. Prior to the 1950s we are mainly talking about commercial artists who produced motoring book illustrations, advertisements, cartoons, designs, technical drawings and promotional literature. These were often jobbing artists who would turn their hand to producing art for wherever there were commissions. Only a few artists working for motoring publications were specialists. Even so, after a few years their interests changed and they moved on to other fields, sometimes to make a name as a fine artist or illustrator but I guess in many cases to disappear back into obscurity. Often those producing the art were not allowed to sign their work or it was blocked out by the agent or client before the final copy. Post 1950, besides the commercial art we see many artists producing art for sale to collectors and describing themselves as motoring artists. Plus we see the formation of The Guild of Motoring Artists. My personal collection is mainly pre-1970 and this database has been published in order to generate interest in motoring art and to help research artists. However, in an attempt at completeness I have included current artists, particularly Guild members. The model for this artist research must be the work done by Rutger Booy on Fred Steerwood. From the initial starting point of two original paintings and some magazine front covers he has built the Fred Steerwood story into a website of several pages http://rutgerbooy.nl/steerwood-introduction. It is hoped that with help from readers we can similarly consolidate our knowledge of other artists. So please if you know details about the pre-1970 artists or have art please contact me.